As the summer draws to a close, I want to bring your attention to a video by Peg Smith, CEO of the American Camp Association. Peg talks with families about the “3 Cs- ” Confidence, Curiosity, and Character- the skills kids learn at camp that they take with them into the school year. Please enjoy this short look at how we can keep the learnings of camp alive year-round! Posted in Alumni, Campers, Parents, Resident Camp, Staff and tagged camp, Camp Jorn YMCA, camper development, campers, campfire, camping, canoe, children, counselors, friends, fun, kids, leadership, learning, nature, northwoods, Now is my Story, parents, summer, summer camp, Wisconsin. Bookmark the permalink. Greetings from Camp Jorn! Our busy weeks at camp have prevented us from posting very often, but please know that we are thinking of all of you, and having a wonderful time with all our campers at CJ! As parents prepare to send their kids to camp, there are often some anxieties about how the camper will do- will he or she be homesick? Make friends? Worry? Ask someone for help if needed? The following link brings the anxious parent and camper to a great article about handling some worrisome camp feelings. We hope it gives you comfort and helps you manage some of your concerns. Please let us know what you think! Below are some pics from this summer. To see more please visit our Facebook page. Posted in Alumni, Campers, CJ Bear, Parents, Resident Camp, Staff, Tucker and tagged 2012, adventure, camp, Camp Jorn YMCA, campers, children, CJ, friends, fun, hike, horseback riding, horses, leadership, music, nature, northwoods, parents, sailing, summer, summer camp, swimming, traditions, water skiing, Wisconsin. Bookmark the permalink. Summer is so close, we can almost taste it! The trees and plants are blooming, the temperatures are rising, and the sun is staying out longer each day. This can only mean one thing…camp is almost here!! With all the excitement and anticipation buzzing in the air, we (the CJ staff) thought we should have an event to not only use that electric energy and get everyone super excited for the summer, but also allow campers to meet some of their fellow session mates, and some of the summer staff before they get to camp. We also thought it would be great for parents get a chance to meet the staff, which for many doesn’t happen unless they make the trek to the magical place in the Northwoods of Wisconsin. So, this past Saturday, May 12th, Camp Jorn YMCA had its first ever Spring Campfire where we brought a little bit of the CJ spirit from the Northwoods to the Old School Forest Preserve in Lake County, IL. From the start, we thought that the idea for the event was a great one, but we couldn’t believe the amount of interest in it until we saw it! We had over 100 campers, parents, and friends turn out to our little Spring Campfire event! To start it off, there was a meet and greet for campers, parents, and staff, with two fires going and s’mores for all. Some awesome field games followed, and then it was time for our main Campfire program. 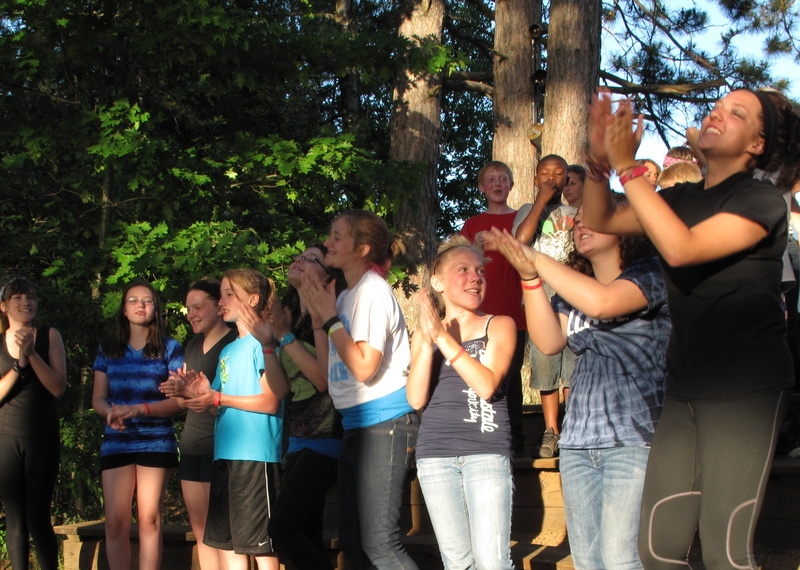 At Camp Jorn YMCA, we call our evening all-camp activity, our Campfire program. For this program, we had a great introduction by our Camp Director, Sarah, followed by some of our favorite songs and skits led by some of our summer staff. For some campers, they were learning these songs and seeing these skits for the first time. And, for others, they were catching up with old camp friends on what had been going on throughput the past year and embracing the songs and skits like they were welcoming them back from a long hibernation. Oh, those crazy camp songs that only other camp people understand and appreciate….And, Parents got to enjoy the night right along with their campers, and get a taste of what Camp Jorn is all about. All in all, the two hour program was a blast, and we couldn’t have asked for a better night! We look forward to hosting many of these Campfire’s in the future and can’t wait to see all of those campers that attended, this summer! Posted in Alumni, Campers, CJ Bear, Parents, Resident Camp, Staff, Tucker and tagged 2012, camp, Camp Jorn, Camp Jorn YMCA, campers, campfire, children, CJ, counselors, energy, forest preserve, friends, fun, Illinois, kids, Lake County, nature, northwoods, parents, skits, smore, songs, Spring Campfire, staff, summer camp, traditions, Wisconsin. Bookmark the permalink. It is hard to imagine a time before cell phones, video games, the Internet and social networks. It’s hard to imagine such times, because it’s hard to believe that we ever survived without such devices, but we did. Today such forms of technology have taken over our lives and the way we live, in ways we probably never imagined possible. Worst of all, it is taking away the childhoods of many children. Take your average American teenager, for example. They probably have a cell phone that is just as nice as the one their parents have. This average American child also spends about 40 to 50 hours a week on social networks, television and video games. In fact they have a whole social world at their fingertips and a whole made up self-image online. They may spend a little time outside at school recess, or sports functions. Depending on their neighborhood, they may not have access to parks and other areas of recreation. Some neighborhoods may be too dangerous, and others far out in the suburbs where parks are only accessible by car. Of course this is not the case for every child, but studies are showing that the majority of our children are simply losing their childhood. Yes, they are being entirely robbed of building forts, getting scrapes on their legs, collecting bugs, and playing in the dirt! They are losing the best part of their years, years that are crucial for exploration, self-development, and building friendships. One of the greatest losses with all of this is a child’s relationship with nature. Our children are becoming nature deficient as Richard Louv coins it, in Last Child Left in The Woods. Our kids can easily name every African mammal, but cannot name a single local mammal other than a squirrel. The childhood their parents had may be much different then their own. Simply put, when we had no reason to be inside, we weren’t. Not having a reason to stay inside, may be why being outdoors was a huge part of being a kid. There are several ways in which parents can bring their children back to nature. Simply limiting the amount of time they use media devices, taking them to natural areas, going on camping trips, and sending them to outdoor camps. Camps such as Camp Jorn YMCA, play a vital role in the development of children. It’s a real life, hands on, life changing experience. Campers grow as individuals, meet friends, learn about responsibility, and discover the world around them. For those kids lucky enough to experience Camp Jorn, they are able to see the northwoods, and live and become a part of it. 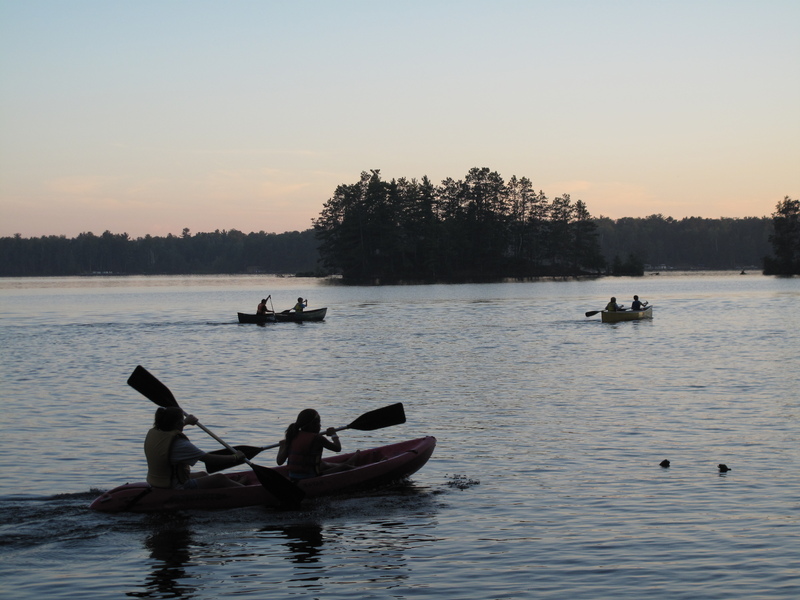 Camp Jorn’s Environmental Program encourages children to take time to discover what the Northwoods has to offer. Campers are able to do a variety of activities, from nature hikes, canoeing to the island and looking for the resident bald eagle’s nest, learning outdoor survival, and looking for small creatures on the shores of Rest Lake. Campers don’t have to be in Environmental class to experience nature. Courses and night hikes are offered for cabin activities as well. On trips, campers explore northern Wisconsin by foot or canoe. They learn how to look at maps, and become more aware of their surroundings. After a whole day of working together to get to their campsite and prepare dinner, they sleep under the stars. More than likely they are awakened by the cries of a common Loon on one of the many lakes in Vilas County. Last year some of our campers sat and watched as the Northern Lights flickered in green and red across the sky; they watched eagles soar, saw the milky way, helped make a fire, sailed across a lake and had days filled with laughter and happiness. Camp Jorn provides a positive adventurous experience for children and adults of all ages. We hope to see you there! Posted in Alumni, Campers, CJ Bear, Parents, Resident Camp, Staff, Tucker and tagged activities, adventure, bugs, Camp Jorn YMCA, campfire, camping, canoe, children, CJ, counselors, dirt, discover, eagle, Environmental Program, friends, fun, hands on, hike, kids, learning, loon, milky way, nature, northern lights, northwoods, Now is my Story, outdoors, play, Rest Lake, sailing, social media, stars, summer, trip. Bookmark the permalink. After each session of resident camp, we ask parents and kids to let us know how the Camp Jorn experience was for them. We are eager to hear about the things we can work on so that we can make the changes we need to make, and we also love to hear what we’re doing well so we can keep doing that! We thought we’d send out a “feel-good” blog post today with some of the wonderful feedback we’ve heard from campers and their parents in the recent past. My daughter had a wonderful time and experience. She loved her time at camp and we hope she has the opportunity to participate in the future. Thanks to everyone for all of your efforts! My daughter had such a good time she didn’t want to come home! She asked if she could go 2 weeks next summer! Way to go Camp Jorn! You guys rock!!! The lessons you teach the children are just phenomenal. My daughter not only learned to be independent, but she learned that having fun doesn’t have to include video games, iPods and cell phones. I LOVE the fact that you guys keep them busy all day long doing actual activities. I would recommend Camp Jorn to everyone I know that has a child. I LOVE you guys!!! I love to hear the stories [my child] tells when she gets off the bus, and how excited she is to tell us. I think Camp Jorn’s staff is doing a wonderful job with these kids! Camp was a great experience overall. It was my daughter’s first time and she will be back next year. Keep up the good work. You can tell by the pictures that he is a happy kid while he is there. Great camp- she had a fantastic time! Everything was great, and the staff was awesome! This was her first away from home resident camping experience. She had a wonderful time and was disappointed on Saturday morning when she had to board the bus to come home. Thanks to everyone for making her first experience an enjoyable one. I was unsure at first about sending her for two weeks… BUT I must say your staff all around helped me be more comfortable with her gone. She had the best summer experience anyone could have ever given her. Thank you again from the bottom of my heart. This was the best experience for my daughter who left shy and reserved but returned full of life, independent and eager to make friends. Thank God for Camp Jorn! The experience is better each and every time for my children and they are planning on attending next year already. Thank you for all that you do. You absolutely make a huge difference in the children’s lives. Top notch! My kids loved it! This has been an awesome experience for my son. I haven’t seen him this happy in a long time. He’s looking forward to being in camp next year. Thank you once again. Great job… thanks for treating my daughter with kindness. Everyone in our group grew personally from their CJ experience– thanks to the staff for a job well done! What did you like best about camp? EVERYTHING! I loved bonding with my fellow TEVA girls! I loved the overnight camping, waterskiiing and sailing. I liked meeting new people and learning how to make different crafts. I like being around kids my own age that treated me with respect. I LOVED horseback riding and water skiing. Camp Jorn is changing lives! Tell us how it’s changed yours! Cabins work together in one of our evening activities. Getting ready to play Wells Fargo! Posted in Alumni, Campers, CJ Bear, Parents, Resident Camp, Staff, Tucker and tagged activities, awesome, busy, camp, Camp Jorn YMCA, campfire, children, CJ, counselors, experience, friends, full of life, fun, horses, independent, kids, leadership, learning, lessons, love, nature, Now is my Story, parents, role models, sailing, songs, staff, stories, summer, summer camp, TEVA, traditions, waterskiing. Bookmark the permalink. Whether your child has been to Camp Jorn in the past, or any camp for that matter, going to camp is still a “new experience” each time around. As a parent myself, I love to see my kids trying new things and meeting new people- I think it helps them grow in ways they normally wouldn’t during their everyday routines. New experiences can be exciting and scary at the same time, but if there’s one thing I believe in wholeheartedly, it’s that the camp experience is one of the best opportunities out there for kids! 1. Help Children Understand When an Event Will Occur – Children can become very excited about activities. They may ask days or weeks in advance about plans. Help children gain an understanding of when an event will occur by marking it on the calendar and having a countdown. This is a great tool- count down the days to camp! 2. Set Expectations – New experiences often come with new rules and expectations. Be sure to set rules and expectations in advance. Prepare children by reading books on or role playing about the new experiences. A good strategy- for camp, you can go over the Camper Handbook with kids, check out the Camp Jorn website, and look at photos and information on this blog and our Facebook page. You can even “pretend” to be at camp the first day, and talk about what your child might experience then. 3. Let Children Participate in Planning – Children will have more ownership in an event if they are able to help plan it. These kinds of activities teach planning and independence skills that apply later in life. The camp experience will “belong” to your child- let them check out the “what to bring” list and pack a lot of their own clothes, talk about activities they want to participate in, and go over how to take care of their things at camp. 4. Build on Existing Skills and Familiar Experiences – When children relate past situations or expectations to new ones they are able to build on existing knowledge. This allows children to have a parallel for their expectations and draw on their past experiences. Sometimes it’s tough to draw a parallel to camp, but it can be related to school field trips in which you have a lot of fun, but need to remember to stay together and follow the directions of your leader/teacher, or a family picnic where there will be a lot of people and fun things to do. 5. Leverage Opportunities for Learning –Events offer a multitude of opportunities for developing skills. Use naturally occurring events to teach new skills or develop emerging skills. 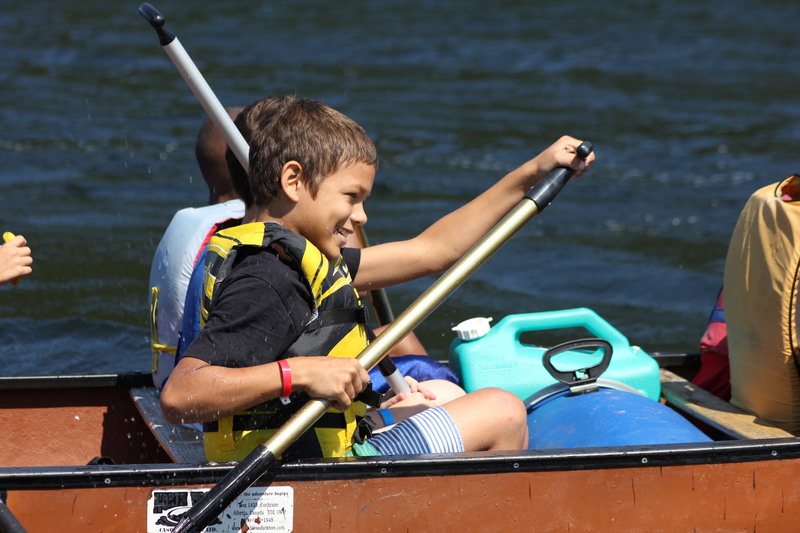 Talk with your child about all the things he or she will be learning at camp- not just how to water ski, or paddle a canoe, but also how to live and work together in a cabin group, how to make new friends, and how to appreciate nature. 6. Use Visuals – Photographs, drawings, or lists can be used as reminders for rules, expectations, or schedules. Visuals can be viewed before, during, and after an event to set expectations, keep children on track, and review the experience. Make sure the choice of visuals is simple, understandable, and easy to access. This is an easy one for camp- check out the Camp Jorn website, Camper and Parent information, this blog, Facebook, the brochure, and any surveys or communication from camp before and after your child’s session. We love to hear from you, and it helps Camp get a better idea of who your child is and how we can make his or her experience the best it can be! 7. Reinforce Appropriate Behavior – Consistent and immediate reinforcement of appropriate behavior gives children a clear understanding of what they are doing correctly. People tend to note when children do things wrong rather than right. Asking your child open-ended questions before and after their camp experience helps you better understand where your child is coming from, and will help you process the experience later. Also, we strive to be sure that things your child learns at camp will be useful to them in other parts of their lives- things you can positively acknowledge and reinforce with them, like independence, compassion, and self-worth. Finally, celebrate your camper’s new experiences by listening to their stories, congratulating them on their successes, and giving them a big CJ hug!! Posted in Alumni, Campers, Parents, Resident Camp, Tucker and tagged archery, cabin, camp, Camp Jorn YMCA, camper development, campers, children, communication, compassion, counselors, curiousity, experiences, friends, fun, horses, hugs, independence, kayaking, kids, learning, nature, parents, positive reinforcement, role models, self-worth, skills, staff, stories, summer, summer camp, traditions, work together. Bookmark the permalink. This story came to us from a social worker who wanted to express her feelings about what Camp Jorn YMCA can do for kids. It can be hard sometimes for those of us who have experienced Camp Jorn to put into words what camp means to us, but this story embraces the essence when we think of our Camp Jorn. Enjoy. I first became aware of Camp Jorn YMCA when, as the classroom social worker, I asked the students in my classroom who would like to attend camp that summer. Immediately, Peter shot up from his seat. He knew exactly where he wanted to go. Well, not exactly, he had to scramble to recall the name of the camp since it had been two years, back in the 4th grade, when he had attended Camp Jorn. When we pulled up the Camp Jorn website, surprisingly we found Peter’s picture on their home page. It is also worth noting that when I asked Peter’s junior high classmates who of them were interested in attending camp, only Peter responded. I sadly noted that even by junior high, some children had lost their hope or enthusiasm for the pleasures of good things to come….. but not Peter! I’d begun working with Peter during his 6th grade year. He came across as a bouncy, sweet kid, but I knew from reading records that his past had been laden with significant family turmoil, displacement from his parents’ home, poverty, as well as a learning disability. At the time he was living with his grandmother. Finances were so tight that when the electric bill went unpaid, the family lived without electricity for a few weeks. Despite family struggles, Peter flourished in school during 6th grade. He went from an impulsive, not very directed kid, to a boy who was conducting himself in a more meaningful, thoughtful manner. Things were looking up. And now he would top off the academic year by returning to Camp Jorn.It was clear in working with Peter’s family that they not only needed the financial support to plan for camp, but also the “maternal function” of someone working out the details between camp and home – that was me. I was warmly and ably assisted in this process by Camp Jorn’s Registrar, Emir Butler. She and her lovely Irish lilt were my first personal contact with Camp Jorn. She was personal and personable, interested in Peter, and ready to assist me in the many ways needed to support him. Peter was so excited to return. Earlier, toward the end of the 2010 academic year, our Special Education District of Lake County (SEDOL) classroom that Peter attended was closed. I’d had to inform Peter that not only was our classroom team of teachers, aides, and support staff disbanding, but that he would be moving to a classroom several towns away. He’d looked at me and said, “Every time something good happens to me, it gets taken away.” We both had tears in our eyes. Since that 6th grade year, Peter had not yet regained his grip on being the student he had become. He continually found himself in a vicious cycle of depression, lack of focus, and limited motivation. But then Camp Jorn returned for him. From about March to June, the largest part of our work together was preparing, with his father, to attend camp. We made decisions about TEVA, locating camping clothing and supplies, and just being excited together. His excitement filled me with happiness for him and renewed hope for his future. I had heard from a colleague that Camp Jorn offered a one-week camp scholarship if a social worker professional donated time to the camp. So I volunteered to spend a week at Camp Jorn, which gave Peter an extra week added to the two-week scholarship from SEDOL, I knew that the longer Peter was in the camp environment, the less likely that he would fall prey to all the difficulties a boy in his circumstances can find themselves in when they have three months of free time and no structured recreational activities available. If you’ve ever seen the 1954 movie Brigadoon, that’s a bit of what I felt as I entered Camp Jorn that Saturday in August. Brigadoon is this magical place that emerges out of the fog once every 100 years. The town’s people come alive and merriment ensues. For some kids, more fortunate than Peter, I imagine Camp Jorn is the icing on the cake of their lives. For kids like Peter, it’s much, much more.. Last summer, when I experienced Camp Jorn firsthand, I understood why Peter reports to me that going to Camp Jorn is the best part of his life. There are many factors. First of all, the beautiful setting. The land and the water are novel and a wonder for many urban kids. Things in their urban neighborhoods can be treacherous and unmanageable. At Camp Jorn they learn to feel the magnificence of our world in a manageable way. They are given opportunities to explore the environment, engage with others, and succeed in ways often unknown to them. Kids, in the school environment, are primarily there to learn, but Camp Jorn is designed to put the cares of life, sometimes lives burdened with worries, loss and limitations, off to the side and focus on play and friendship building. I know for Peter, and I imagine for other kids, school can be a place where students with learning problems or family concerns are forever feeling lesser than others. Not at Camp Jorn. Camp Jorn programs and activities are set up for children to succeed, not necessarily in all areas, but in many. These successes can and do linger with Peter throughout the year. The counselors are terrific. Many of the camp counselors, counselors in training, and even some of the administrative staff have attended Camp Jorn in their youth. They have wonderful memories of their experience, know what it has done for them, and want to provide it for others. Many of the counselors are high school or college students themselves and, therefore, “tell it like it is,” which I believe promotes a sense of realness, a sense of alternative family, a sense of community, and above all, a sense of playfulness. The ability to play is an essential ingredient for developing creativity and a joyful life. Even though his second experience with Camp Jorn was as wonderful for him as the first had been, Peter has continued to struggle. During his rough 7th grade year, Peter and I maintained contact in a slightly different way, not as the direct therapist working with him in the classroom, but as an outreach worker. Whenever we speak about Camp Jorn, Peter lights up. This spring, when beginning our planning for Peter’s next summer at Camp Jorn, Emir asked me what would happen to Peter and Camp Jorn when I no longer worked with him. She reported that repeatedly she has seen a camp “regular” fall off the radar, never to be heard from again. I was so moved by her personal investment in this child. Attitudes and dedication like this among Camp Jorn people are ultimately what makes it such an important experience for kids like Peter. I’ve learned from speaking to Peter over these past years and observing him at Camp Jorn this past summer, and observing Camp Jorn itself, that in the right setting, with activities thoroughly orchestrated to enhance fun, skill building, playfulness, friendship, and community, the participants at Camp Jorn are exposed to the sweetest experiences in life. The thoroughness and the duration of the Camp Jorn experience actually set in motion, for youths like Peter, a sense of hope, and in my experience as a social worker, hope is one of the most valuable things we can give to our kids. Posted in Alumni, Campers, CJ Bear, Parents, Resident Camp, Staff, Tucker and tagged Brigadoon, camp, Camp Jorn, Camp Jorn YMCA, children, counselors, engage, environment, explore, fun, good, good things, kids, lessons, nature, students, success, summer, volunteer. Bookmark the permalink.